To improve the condition of backward and poor classes in Uttar Pradesh, the government of the state continues to release new schemes. This will help to improve the condition of girls and women in the state. The state government has planned to launch a scheme that will provide money for a girl’s marriage and other expenses relating to their marriage. The scheme is known by the name of Mukhyamantri Samuhik Vivah Yojana . Increased amount – The amount of the scheme has been increased from 15 thousand to 35000 thousand along with certain changes in the scheme. Out of the 35 thousand, 15 thousand will be given for the purpose of marriage, and the rest of the money will be paid as tax. 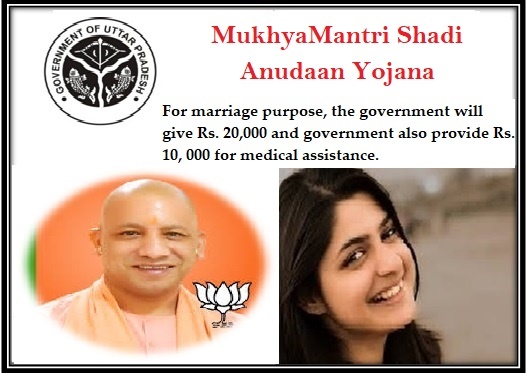 Financial assistance – According to this scheme, the girl will be given a direct amount of 51 thousand for the purpose of their marriage. The money will be credited in the name of the girl, and it can be used only for the marriage of the girl. Government has decided, if they get 10 or more than 10 applications then government will be organized Mass Marriage [Samuhik Vivah]. Age limit – Under this scheme, the girl’s should have a minimum of 18 years of age, and the boys should have a minimum age of 21 years. The beneficiaries will be able to apply for the scheme, and they have to fulfill their age eligibility for the same. For the correct proof of the age of beneficiaries, they should submit their birth certificate at the time of submitting the application of the scheme. Income criteria – The annual income of the family should not exceed rupees 47 thousand to avail the benefits of the scheme. This limit is set for the ones who are living in the village area. For the ones living in the city, the limit of annual income is rupees 56500. For this, the applicant has to submit their income certificate at the time of submitting the application of the scheme. Residential proof – Only the beneficiaries living in the state of Uttar Pradesh are applicable to avail the benefits of the scheme. The beneficiaries have to introduce their original residential proof. Rule for a widow or divorced – The state government has planned to support the concept of remarriage and therefore, the widow and divorced are also included to avail the benefits of the scheme. Maximum of 2 girls – The main purpose of the above-said scheme is to promote marriage plan for girls. From each family in the state, a maximum of two girls is allowed to avail the benefits of the scheme. Caste or religion – People belonging to Scheduled Caste, Scheduled Tribe, Backward Class, Minority and General class can apply to avail the benefits of the scheme. At the time of online registration for the scheme, if the applicant does not have the Aadhaar card, they can produce the following documents. The state government has arranged for offline process relating to Kanyadan group marriage scheme. Beneficiaries have to contact the municipal corporation for submission of the application for relating to the scheme. For the ones living in rural area, they have to submit the application form to the village panchayat, block or district officer. The state government has already informed most of the District City officials to take necessary steps in the submission of the application form. The applicants have to fill in the required space in the application form with correct information. When submitting the form, they have to attach the required documents asked for in availing the benefits of the scheme. The BDO officer of the village will be in charge to verify the documents submitted. After the verification process, a list of selected candidates will be introduced who will be able to avail the benefits under the scheme. Previously, it was seen that beneficiaries tend to fill in the application form with incorrect information and therefore made false claims of the benefits of the scheme. Due to this, the amount would get credited to the wrong person who was not eligible to avail the benefits. Therefore, now the process has been verified strictly to ensure that the financial support reaches to the right person. Relating to the collective marriage scheme, the government has sanctioned over two crores budget. The main objective of the government is to improve the welfare of women.